What's New in this Lightroom Release > Lightroom CC iOS/Android Updates > What’s New in Lightroom CC February 2018 release? You can now automatically add your copyright to photos as they’re imported by checking Preferences > General > Add copyright to imported images. It’s smart enough not to overwrite any existing copyright metadata, and it won’t update any existing photos. You can now fix geometric distortion using the same tools as the desktop, including the automatic and guided upright modes. You’ll find the controls in the Geometry tab in Edit view. You can now add a simple text based watermark when sharing photos from the Android apps. To set the preferences, tap the menu icon in the top left corner of Organize view, and go to Preferences > Sharing Options. Toggle the Share with watermark switch and tap Customize to set the watermark properties. Here you can select the location, opacity, font and size. If you’re working in another photo app, tap Share and select Add to Lr to send the photos directly to Lightroom’s All Photos album, without having to stop and switch to Lightroom to manually add the photos. Migration to Lightroom CC fails if the storage drive location doesn’t have read/write permission. See this TechNote for a workaround. While importing photos or videos, MTS video previews in the grid appeared blurry or blank. In Detail view, the Edit Capture Time dialog (Photo > Edit Date & Time) displayed a spinning wheel icon while the Info panel is closed so you were unable to edit the capture time. ‘Keep Original Available Locally‘ didn’t always respond when multiple images are selected in the grid. Videos were missing the camera make/model metadata in the Info panel. Error when launching Lightroom CC: Unable to setup WF RTMFP Notify Pipe. ‘Send to Facebook‘ now uploads a larger photo, whereas it was limited to 960px. Laura Shoe recommended your site to me. Good to meet you Peter! Hi Don. This article is for Lightroom CC, which is the cloud-based app. (Yes, I know the names are confusing!!). To add copyright during import for Classic, you’d need to create a Metadata Preset and add it in the Apply During Import panel of the Import dialog. I wonder how many years before CC has feature parity with Classic. I image that when it does, Classic will be no longer supported in the same way as standalone Lr. You may be right, but it’s taken more than 10 years to get LR Classic to this point, and looking at the amount of time and money they’re investing in improving Classic, I don’t think we need to worry about it for a while. I have no desire to engage the cloud-based option so knowing whether the perpetual licence option will in future be updated by Adobe will be helpful. Lightroom 6 = last version available as a standalone/perpetual license. Still available for purchase, but won’t be updated again. Lightroom CC = the brand new cloud-based service for desktop and mobile devices, which this post is taking about. I think the annual subscription fee for LR6.14of 9.99 a month, i.e. 119,88 a year is too expensive for ambitious amateurs. Furthermore we don’t know what Adobe will do in the future. I think it is worth thinking of other programmes because Adobe is apparently not interested in amateurs anymore. That’s fine, we each get to make that choice, based on whether we see value in the subscription. I bet most amateur photographers used to spend more than that on film and processing each year. 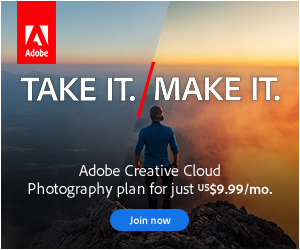 I think their new Lightroom CC release, which is clearly targeted at amateur photographers, shows they’re very interested in amateurs though. Your “Quick Start Guide” for LR is the clearest and most helpful source I’ve found, as a new user of LR “Classic.” Two books that I bought, by eminent LR experts, are more confusing than helpful to a beginner. Thanks for restoring my sanity. I’m really pleased it helped Ike! Not sure if this the right place to ask the question but perhaps you can point me in the right direction. Until recently I was using Classic CC on my MacBook Pro but with all the traveling I am doing I want to be able to carry just my iPad Pro. So on the iPad I can download and look at my pictures on a daily basis and edit some of them. They are being saved in Adobe Cloud but my dilemma is how to import them into my permanent library on my Mac once I get home. And when I learn how to import these pictures will it also bring the edits along too. A supplementary question is will the iPad convert the pictures to DNG and if so how does one achieve this? What are you running on your Mac at home? Classic? If so, turn on sync and it’ll download any new photos and edits you add to the cloud. There are some gotchas to be aware of, like keywords don’t sync, and you have to be careful where you delete them to delete them everywhere, but I’ve detailed all of that in the Cloud Sync chapter of my Classic book. iPad won’t convert to DNG, but you can do that with the Photo menu > Convert to DNG command when they sync back down to Classic, or leave them as their original format.